Clint Black, known for his big country sound, has teemed up with female powerhouse, Sara Evans to deliver an unforgettable show to their Washington fans at Tulalip. 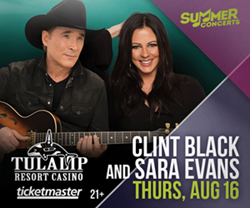 In his only US appearance this year with Sara Evans, Clint Black stops at Tulalip Resort Casino’s Amphitheatre as part of his extensive North American Tour. In his only US appearance this year with Sara Evans, Clint Black stops at Tulalip Resort Casino’s Amphitheatre as part of his extensive North American Tour. This is the last Washington show this year for Sara Evans, and your opportunity to hear hits like “Born to Fly” and “A Little Bit Stronger” live under the stars! Because of their extensive tour schedules, Clint Black and Sara Evans rarely perform together, meaning that this may be your only chance to see the two country stars together for years. Clint Black recently released On Purpose, the first album of completely new songs in over a decade. He’s known for his iconic voice and songwriting style, as well as being at the forefront of the transformation of country music in the 1990s. Sara Evans is a female superstar not just in the country artist arena but also as an entrepreneur with her company, Born to Fly Records. She has eight studio albums and won Top Female Vocalist from the Academy of Country Music Awards. Tickets for this memorable country music event are available at http://www.ticketmaster.com or at the Tulalip Box Office. For additional information, visit http://www.tulalipresort.com. Award-winning Tulalip Resort Casino is the most distinctive gaming, dining, meeting, entertainment and shopping destination in Washington State. The AAA Four-Diamond resort’s world-class amenities have ensured its place on the Condé Nast Traveler Gold and Traveler Top 100 Resorts lists. The property includes 192,000 square feet of gaming excitement; a luxury hotel featuring 370 guest rooms and suites; 30,000 square feet of premier meeting, convention and wedding space; the full-service T Spa; and eight dining venues. It also showcases the intimate Canoes Cabaret and a 3,000-seat amphitheater. Nearby, find the Hibulb Cultural Center and Natural History Preserve, Cabela’s and 130 designer names at the Seattle Premium Outlets. The Resort Casino is conveniently located between Seattle and Vancouver, B.C. just off Interstate-5 at exit 200. It is an enterprise of the Tulalip Tribes. For reservations, please call 866.716.7162 or visit us at http://www.TulalipresortCasino.com. Connect with us on Facebook, Twitter and Instagram.